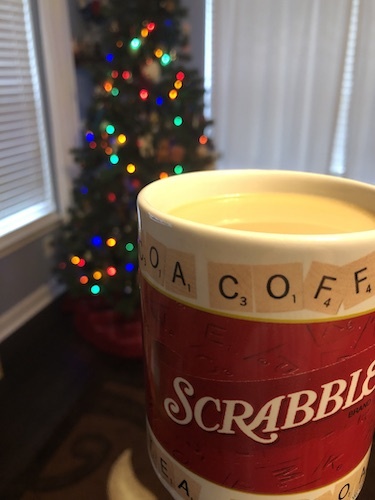 Sunday Coffee – Let the Christmas season begin! I love Christmas. It’s probably my favorite time of year, edging out Halloween just slightly. Christmas begins for us the day after Thanksgiving, and continues full-steam through the end of the year. We have our gifts planned and mostly bought, and our Christmas decor and lights are up. 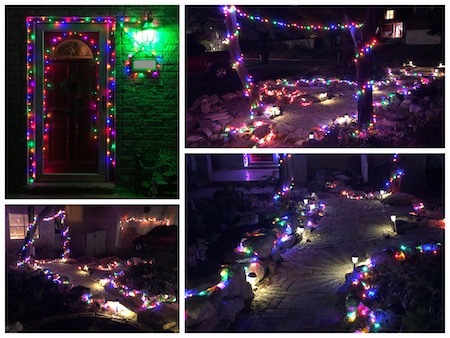 (Sadly, the lights around our door got kinked on the second day and no longer work. Boo!) The boys cracked me up when we put up our tree. We have a series of nutcrackers and they put them all in one clump together at the back of the tree. And Laurence and Ambrose both decided that all the old homemade (or school-made) decorations that included their photos were going in a small section at the back so that they wouldn’t be seen. They kept trying to get us to get rid of them. Ha! As if we ever throw away any ornaments unless they break! I still have one ornament my mom made out of a raisin box and wrapping paper when I was a toddler. We have so many Christmas traditions that will take place over the next few weeks: sugar cookie decoration, Pee-Wee’s Christmas Special and Rudolph the Red Nosed Reindeer, reading the boys’ “stories” they wrote in little books as toddlers, putting out shoes for St Nick’s day, advent calendars (already ongoing – we have eight), etc. And that’s all before our 5+ Christmas celebrations with different parts of the family. We’ve also been working hard to keep the cats away from the tree. This is Atticus’ and Jojo’s first time with a Christmas tree, and while so far it’s not as bad as it could be, they do think the ornaments are fun things to pull down and bat around the living room. I’m sure they’ll get better with time. How has your holiday season started? 4 Responses to Sunday Coffee – Let the Christmas season begin! First off How amazing is your tree?!! My goodness, I absolutely love it! I’m not super big on holidays but the family love it so I’m for whatever the family can do together to stay close!I’ve always had great Christmas times growing up and this year will be no different! I try not to put the presents under the tree till about 10 days before Christmas because they will shake them to death.lol. I just love the look on my families face we sit around and have hot drinks and watch the lights and stuff. I can honestly say as far as presents I have always gotten everything that I wanted so when Christmas comes it’s about the family and it does my heart good to see you enjoying the season and getting around to 5 celebrations! That’s great, you only live once and true joy is golden so I wish you the best time possible this Christmas and the rest of the Holiday season my friend! Yeah it’s all about family for me. I love all these traditions! 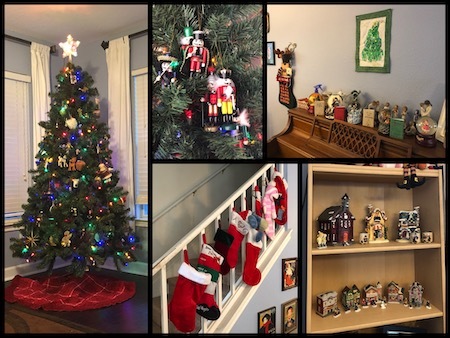 I don’t start the holidays until December, so this past weekend, I finally put away the autumnal decor and pulled out the Christmas stuff. I still need to finish decorating the tree, but I can work on that during the evenings. This will be Cletus’ first year with the tree as well. So far, he’s frightened of it and avoids the room in which we have it. I feel bad but then I figure he will adjust and will decide to try to taste a bit of everything within reach – because he is like a little baby and puts everything in his mouth. It should be fun. Good luck with you and the puppy and the tree! Our kitties are being fairly well behaved, though still pulling down ornaments and batting them around. Even Nimi is doing so, and she was just fine last year! I think Jojo and Atticus are bad influences.